Men & Mice announces the release of version 6.7 of the Men & Mice Suite. The Men & Mice Suite is the ideal tool for network managers who need superfast daily management, planning, reporting and auditing on growing dynamic IP networks, delivering the added benefit of improved network security as well. To ensure the solution will scale with businesses as they grow, the Men & Mice Suite integrates with the widest available range of DNS servers, such as BIND, Microsoft DNS services and Unbound. The 6.7 edition adds PowerDNS to enable customers to run hybrid environments for tightened security. In this release Men & Mice takes flexibility one step further with the addition of Amazon Route53 DNS services support. Enterprises moving to the AWS cloud or running hybrid private/public clouds can now keep full control of their DNS, DHCP and IP environment with the Men & Mice Suite. The Men & Mice Suite now supports Route53, Amazon’s cloud DNS service. With this integration, users can manage DNS information stored on the Amazon Route53 DNS servers in the same way they can manage DNS on other supported platforms, such as creating new zones and edit DNS records in existing zones. PowerDNS, an open source, high performance DNS server, is now supported in the Men & Mice Suite. This capability will especially benefit customers with complex hybrid environments, as they will be able to manage all their diverse DNS servers from one solution, regardless if they are BIND, Microsoft DNS or PowerDNS servers. The increase of mobile devices (BYOD), the Internet of Things (IoT) and the growth of cloud-based virtual machines has caused a seismic shift in the DDI landscape, leading to greater awareness of network-related security risks. Security manifests itself in various formats, such as availability, performance and the ability to withstand attacks like DDoS Attacks, DNS cache poisoning and other DNS security threats. The Men & Mice Suite helps network administrators address such risks by offering hybrid DNS server support and high availability. The 6.7 edition of the Men & Mice Suite adds DNS and DHCP service Monitoring and support for TLSA records that enable the storage of/and signing keys that are used to verify SSL/TLS certificates through DNSSEC. The Men & Mice Suite now actively monitors the status of the DNS and DHCP services on all managed platforms and will alert users if the services become unavailable. In addition to being displayed in the user interface, the alerts can be sent to monitoring systems for further processing. This will serve to maximize availability and enable customers to avoid costly unscheduled downtime. TLSA records, in conjunction with DNSSEC signatures, provide an easier and more secure way for applications such as Web browsers and mail servers to authenticate SSL/TLS certificates. Support for management of TLSA records has been added to the Men & Mice Suite. For more info on TLSA and DANE (DNS-based Authentication of Named Entities), users can view a recent Men & Mice webinar on the topic. Handling of reverse records and reverse zones has been enhanced in this new version and is now much more tightly integrated into the IPAM module. Users can select any number of subnets and create and/or update the corresponding reverse entries for the subnets. Reverse record (PTR records) details are now also included with the IP address details in the IPAM view. Role-based access allows customers to create roles in the Men & Mice Suite and assign these roles to users and groups. All supported users and groups, whether Men & Mice built-in or from Active Directory or Radius can have roles assigned to them, which will greatly simplify access administration while providing a more flexible access model. or Call us at +1 408.516.9582 to speak to a sales representative. Men & Mice is proud to introduce a world class solution for high performance, secure DNS caching; The Men & Mice DNS Caching Appliance! 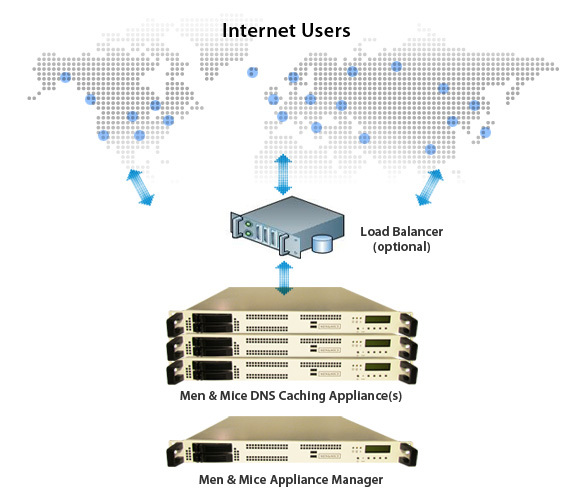 The Men & Mice DNS Caching Appliance is built using the open source Unbound DNS Caching resolver. Unbound has excelled in security tests and fully supports DNSSEC validation. Unbound is also designed for dual-stack environments and IPv6-only setup. Service providers rely on caching DNS services in their business and enterprises are increasingly operating their caching DNS separately for security reasons. Our goal with the Men & Mice DNS Caching appliance is to provide a robust, fast and simple appliance for a fair price. The Men & Mice DNS Caching appliance is a single purpose appliance, designed and built to maximize the performance of both hardware and software. Your Internet service is only as fast and reliable as your DNS Caching Servers. Benchmarking shows it to be up to two times faster than conventional DNS Caching servers! The appliance runs on a proven, solid hardware and comes with built in fault tolerance. The appliance manager is available, either in a separate hardware box or as a virtual appliance. Ease of installation and excellent management capabilities make our DNS Caching Appliance the perfect choice. Insert the SD card provided and you will be up and running within minutes. In the same way, replacing and adding new devices is a simple task. and much, much more, just give it a try! Go ahead, fill out the form and we will be in touch! The overview of the IPAM Module of the Men & Mice Suite continues! Subnet Monitoring: The minimal number of free IP addresses can be defined as threshold. This can be done either on subnet level or globally for all subnets. In combination with the DHCP module you can also define monitoring/alerting for dynamic address ranges (scopes). Users and groups can be defined in the Men & Mice Suite. The authentication can be done with the built-in methods: M&M internal, Radius or Active Directory. Granular Access Control: For the defined groups and users the access can be granular restricted on IP address range level. E.g. allow a group only to view certain subnets for informational purpose, whereas another group might have editor rights, to assign hosts to IP addresses and change or define the meta data. Locking of Subnets: With the necessary permission subnets can be locked, which automatically blocks the access to the IP addresses that are inside of the locked subnet. Claiming of IP Addresses: IP addresses can be claimed/waived. This allows users to signal other users that an IP Address should not be allocated. A user who tries to allocate a claimed IP Address will be prompted.